You have no name when you are born. And there is no concept of numbers when you are born. Symbols that make believe that there are separate things are the dividing factor. Your fate is already set in stone as your true name contains your fate / destiny before you were born. Our mortal path(s) are accepted by GOD where only 1 will lead back to Him while the rest fail via reincarnation. i agree that the Mark is identification and so is DNA. Ok. So symbols are a dividing factor. In what way ? Sigils, patterns, resonance ? "No concept of numbers": Then what of the 75 million people who have been cursed to see the 11:11 Wake -up Call on a regular basis & more; especially when codes pop up in dreams after "demanding" the "spiritual world" to give numerological codes in dreams as well ? So what would make it "Swell" and intriguing ? The idea that we were all once naive angels and ignorant of all evil / sins etc and decided to descend from Heaven into Hell (Darkness - Universe) and endure material temptation for eternity via reincarnation ? So symbols are a dividing factor. In what way ? Words are spells.... Hindu and Muslim equals division. Did you know any concept when you were first born? The first concept to divide was 'I am'. Then 'this is me' and 'that is not me'. i wish you never said words are spells. i think we are cursed into witchcraft that we will never be able to exit from. Ok so we all slowly merge into a "Group" where they are similar to "me". What if dreams / visions show witches ? Does that mean you are a witch ? What if one turns ? is that soul a Traitor ? Subconsciously - i might have known everything that was necessary to work towards. Consciously - i knew nothing. What happens when one understands that their life path is narrow and potentially damned to fail ? 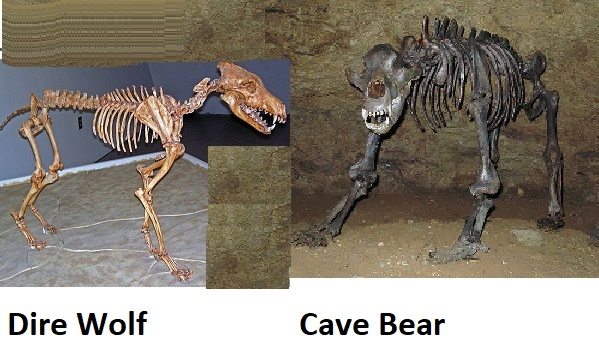 One day Cave Bear met Dire Wolf, "Dude what happened to you?" DW: "You tell me first." CB: "Humans happened; they successfully competed for habitat. No caves left for me. How about you?" DW: "My normal mega-fauna prey was getting scarce, then humans finished them off. No mega food, no mega me!" CB: "We never met in normal life. Where the hell are we now?" DW: "Best I can figure, in some human's head." CB: "Well that's good. He can warn the other humans about habitat and food resources." DW: "Nah, he isn't an alpha male; not even a pack advisor. No one is compelled to listen." CB: "I'm not sure I understand what an alpha male is, or an advisor for that matter." DW: "It's a social structure, like hunt together eat together, helps a lot. Alpha male is the leader." CB: "So if he gets to be alpha then people will listen?" DW: "It's really complicated, there's markets and politics and all sorts of competing structures." CB: "So, … the humans are sort of doomed then?" DW: "Pretty much, it's kind of a bummer." CB: "Well, I guess we've both been there, done that. Yeah, bummer." Ok: Prove it: Spell a word - like "Kilash" - and prove to me that it means something ? U know; a STUPID (provocation) daemon once met me face-2-face and stated that they are "In total control"; however, i believe they are bull#ting their assess and hav'nt got a clue on how to defeat Yahushua on the Day He returns. Yahushua will defeat them 100% that final day; and they know it. lol the same ones serenading the apocalyptic Christian sectors personell who control the nooks! the assumption being those indoctrinated and have passed muster to take responsibility for instant sunshine may very well not know enough to counter the dark night of the soul. The Christian apocalypse will happen whether people want it or not. They might control the nooks now. However they are destined for the Lake of Fire. That will wipe the smile off their sorry faces. Ok. So if one has witnessed the dark side inside Tartarus (+Lake); being classed as a traitor amongst their own kind; would they be "ready" to drag the fallen Repheim away from Sheol ? Are they ready to Never Smile Again like a Reaper ? Once they put the "Gauntlet" of responsibility on their hand, the devil will know their every weakness / Achilles Heal / red button. Once certain spirits have witnessed and "felt" the dark feelings down in the depths of hell and taken responsibility to NEVER forget those experiences; then they are ready to fight alongside Yahushua in the coming battle.